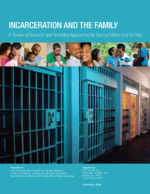 As most family strengthening programs in prison take place in a group setting, they face barriers related to stigmatization. Asking men to share their thoughts, in a group setting, on difficult issues involving their children is a challenge (Palm, 2001). Pressure to be unemotional or to disrespect ex-partners may interfere with fathers’ ability to express their actual feelings about fatherhood or relationships. One program has reduced stigma by establishing ground rules and using icebreakers (Palm, 2001). Program implementers should continue to address fathers’ perceptions that participating in such programs indicates that they are weak or have family problems.